Le scaloppine ai funghi sono un piatto davvero facilissimo e gustoso. Può essere eseguito sia come piatto di tutti i giorni sia per accompagnare un menù elaborato. Battere le fettine di pollo, infarinare leggermente e fare rosolare in olio e burro con un pizzico di sale e di pepe. Bagnare con il vino e lasciare evaporare. 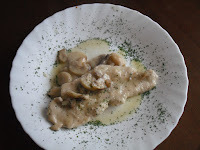 Unire i funghi e bagnare con 1/2 bicchiere di acqua. Cuocere per 15 minuti a fuoco basso e a pentola coperta. Regolare di sale e pepe. Fare asciugare il fondo di cottura a piacere e servire. antipasti assortiti anche a base di salumi o pesci affumicati, primi piatti leggeri, secondi piatti a base di verdura o di pesce, Prosciutto di Parma, frittate, erbazzone, minestre di verdure. 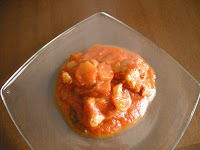 This stew with tomato sauce is a traditional dish Calabrese. The farmers of the prepared only once for major religious festivals throughout the year, This is because the meat was not a dish that a farmer could afford to eat every day, the meat was very expensive as well as raising cows and pigs, why the meat was consumed poco.Inoltre prepare this stew also means getting a great sauce for pasta. 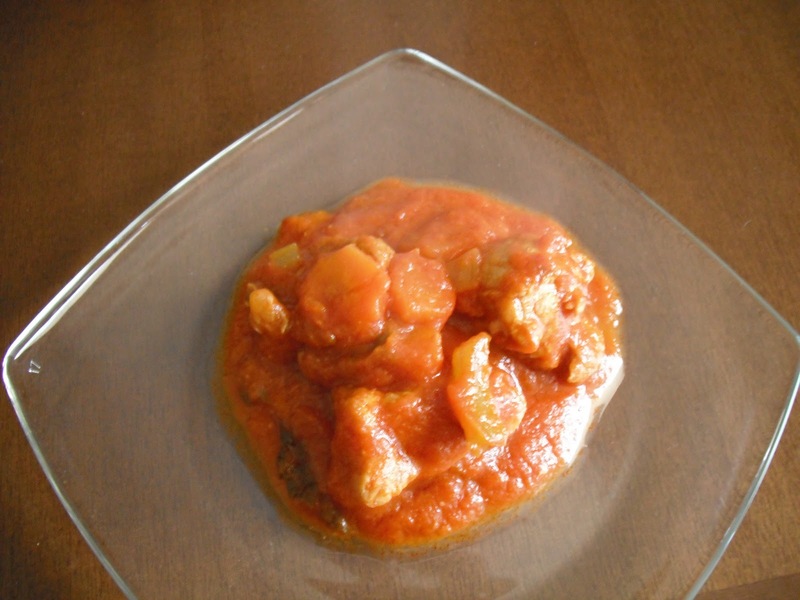 This recipe was given to me by the chef of the house, my grandfather.During his travels around the world, told me several times to have prepared this delicious stew. And even if not always easily available ingredients typically Calabrian for the preparation of this stew (like the excellent pecorino cheese that is grated directly onto the pasta with the sauce. This cheese can be found in the province of Vibo Valentia, the sale also Tropea, so if you happen to buy it in those areas!) told me that the taste and flavor of this dish is mainly in the choice of meat and not so much of the spices that are used. 1 liter of tomato sauce Cirio "The Sovereign" * or * Valfrutta "Cream"
Cut carrots into thin rounds. Chop the onion and chili. (Cut the celery into thin rounds also, if you add it. )In a pan with little oil, add the chopped carrots, onion and chili. Brown soon. Add the meat to seal (brown) on all sides. Add a pinch of salt and blend with the wine.When the wine has evaporated, add the tomato sauce a couple of glasses of water. Close the pan with a lid and cook over low heat. Occasionally stir with a spoon and if the sauce gets too dry, add water. Cook for 2 to 3 hours until the meat becomes tender. Check by inserting a fochetta cooking the meat. If the meat is easily broken, which means it is cooked. Shortly before removing the meat with the sauce from heat, add salt and boil for 5 minutes. Then put out the fire.If you want pasta, you do this procedure: Remove the meat from the sauce. Put the pasta cooked just al dente, in a wok with a little water has been cooked, add the sauce and cook for a minute. Add the grated pecorino Calabrese. Jump again. And bring engages. Add more cheese on the pasta, to taste. Those who do not have an pecorino Calabrese of Monte Poro, may use the Parmigiano Reggiano. 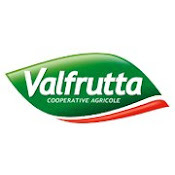 PRODUCTION AREA: the province of Vibo Valentia. PAIRING: though young, is served with vegetables and served with fragrant dry white wines, if mature, to be combined with medium-bodied red wines.All local wines Pecorino di Monte Poro is considered among the best sheep in southern Italy. 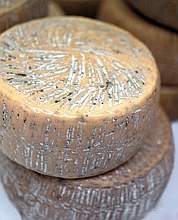 The long tradition in sheep, practiced in the area since time immemorial, the special production techniques and the variety of grass are all factors that produce a cheese flavor and aroma characterized by particularly large. For its production using sheep's milk from local breeds of sheep, milk, previously warmed, rennet is added for it to coagulate, the curd is then broken and separated from the whey.The cheese mass is then pressed into molds and salted. The seasoning has variable length, shorter or longer depending on whether you want to get a fresh, delicate flavor, or a cheese more salty and spicy. If little cheese, Pecorino di Monte Poro has a crust of yellow, elastic and not too thick, and its pulp is pale yellow and tender, the flavor is delicate, the flavor, sweet, has memories of milk and pastures. If aged for a long time, has thick crust of reddish yellow color, the paste is firm and pale yellow, the flavor is aromatic, the flavor is intense, pungent and salty. This recipe created by my grandfather, a professional chef, and proposed in kitchens all over the world. Handed down from generation to generation, even today finally come to your table. 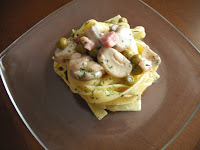 A perfect recipe for those who did not have much time for cooking, but who wants to impress with a plate full of flavor. In a pan pour a little oil, fry a clove of garlic, and add the mushrooms. Stir for a minute. Add the chopped parsley leaves part of it for the final decoration and bacon and stir. Then add the peas and half a glass of water if necessary to cook the peas if one were to use fresh ones. Cover the pan with a lid and cook over medium low. For about ten minutes. Put in a pot to boil water. Check the cooking of the peas in a pan, add the cream, season with salt and black pepper. Cook for 5 minutes or until the cream will start to shrink. Turn off the heat. Make sure the water reaches the boiling pot and pour the noodles. Cook the noodles for a minute maximum. Turn on the burner under the pan. Throw in the noodles with a little liquid has been cooked. Jumping with the sauce for a minute. Decorate the plate with a little parsley advanced. Serve. The scallops are tender and tasty slices of veal, from flour and serve with tasty vegetables. From the kitchens of great chefs of Barilla comes to us this delicious main course! PREPARATIONCarefully clean the artichokes, remove the stem and the leaves harder.With a sharp knife, remove the leaves hanging close to the heart.In order not to tarnish the artichokes, moisten with lemon juice.Prepared in the cold water slightly acidulated with lemon juice: this way you can dip the artichokes and prevent blackening.Cut ends of the leaves of the artichoke, in such a way that there remains only the softer part of the central leaves and the heart.Cut them in half and remove the hair inside.Peel and clean the stems of the artichokes.Slice very thinly all: immerse the artichokes in water acidulated. 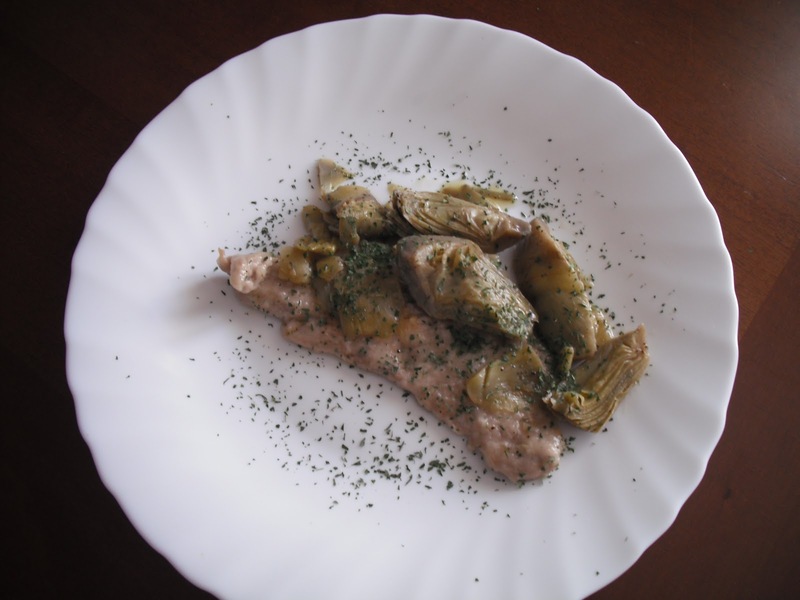 In the meantime you heat a few tablespoons of extra virgin olive oil with a clove of garlic when it is hot, add the artichokes and cook for about ten minutes. Meanwhile, prepare the scallops.Spread the slices of meat with a meat tenderizer and practiced some small cut in the corners to avoid that during the cooking bulge.When the artichokes are ready, add salt, pepper and parsley, remove the garlic and place them in a pot.Flour the cutlets and cook in a skillet with a tablespoon of oil.Season with salt and pepper and add white wine.Let the wine evaporate and add the artichokes.Let it cook a couple of minutes: the dish is ready.Serve the scallops with artichokes and a grinding of fresh black pepper: bon appetit!